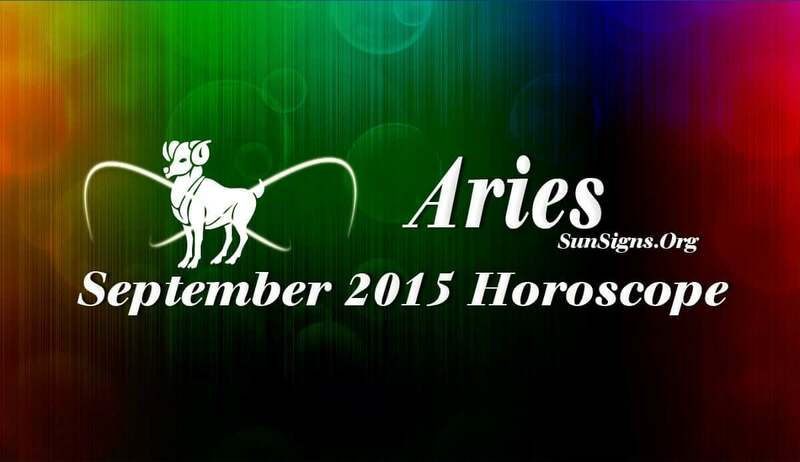 Aries September 2015 Horoscope predictions foretell that you should use your friendly nature to attain your objectives this month. Seek the cooperation of others and adapt yourself to situations in order to succeed. A change in the planetary strength to the Northern half of your birth chart on 23rd will focus your attention on career and social life. Family and emotional matters will be in the background after that. You have to exert yourself to achieve your goals. Mercury retrograde in September 2015 is not favorable for job seekers. Arians should not be in a hurry to accept job offers. They should be examined thoroughly. If you are not happy with the terms and conditions, you should wait for better business opportunities. The Aries monthly astrology forecasts for September 2015 foretell that the first half of the month is lucky for financial dealings. Your money management will be excellent. Earnings will come from social contacts after 15th September 2015. Conflict between family relations and romantic partnerships is predicted for the Rams. You have to strike equilibrium between family and romance by devoting sufficient time for both. Singles will have many opportunities to find love mates and these affairs may culminate in marriage in future. You will have a hectic time dating in your social circle. Love is to be found in the office environment or social gatherings. This is a good month for pregnancy and activities with children. The September 2015 Aries horoscope predicts that your health will be delicate this month and you should take it easy after 23rd. Learn to relax and enjoy life. Do not make any significant changes to your diet and fitness schedules. Here are a few morning rituals that can boost your mood in general.